Light and quick—this sleek, palmable Pflueger Echelon LP Baitcast Reel has what it takes to handle a wide range of techniques. With beefed-up internals and a reinforced graphite frame and sideplates, the Echelon LP is a reliable choice for day in, day out use. Machined and anodized, ported aluminum spool; six-bearing system including five double-shielded stainless steel ball bearings and a one-way clutch instant anti-reverse bearing; adjustable magnetic cast control; smooth multi-disc drag; Soft Touch handle knobs. "i have only owned this reel for a few months but so far so good. best reel i have in my arsenal. if your on a budget but still want a nice reel, this is definately the one"
"Best baitcast for the money. casts smooth and feels good. Doesn't catch many fish but I think that my problem. Haha"
"This reel cast very well it is light and palms well. Great value especially for the money. 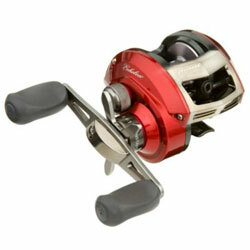 Pfliuger does a great job with initial start up of the reels and this reel is no exception."